Interview with Willa Black, VP Corporate Affairs at Cisco. 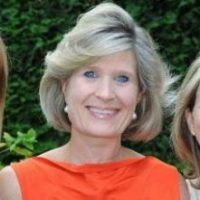 Experts in CSR Series: Willa Black shows us that social innovation and intrapraneurship is possible inside every organization. In 2007, Willa got bit by the ‘social impact’ bug and ever since she’s been on a mission to drive transformational change. As a visionary leader, Willa saw opportunity where others didn’t. She not only thought about doing something better, but also different. Willa is the force behind Cisco Canada’s CSR strategy, including Connected North, one of Cisco’s bespoke CSR initiatives. She epitomizes leadership, as she wins trust and support both inside and outside of her company. What sets her apart from others is her insight to use her company’s core business competency for social good and her ability to collaborate and get things done. Her passion and drive is inspiring, making you pause to remember the power you have to do good in this world. 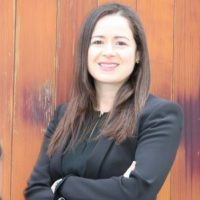 In our interview, Willa speaks about developing Cisco Canada’s CSR strategy, how to get things done, and amazing advice for having a job like hers one day. When did you know you wanted to work in social impact/CSR? 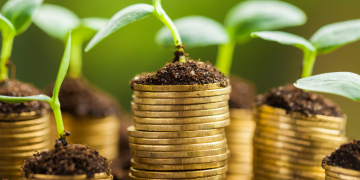 In 2010, Cisco Canada launched a Cause Marketing program called “One Million Acts of Green” – which challenged Canadians to “commit” green acts and register them on a shared platform. The goal was to rally Canadians to act in the interests of environmental sustainability. We gave ourselves six months to register one million acts. To get there, and to get people to go to the site and register, we made the challenge very personal. We showed exactly how much carbon could be saved with each “act”. The idea was that while we may not feel that we could have significant impact as individuals, when we all come together as an aggregate, the results can be powerful. And the results WERE powerful: In 105 days the program accomplished its one very public goal: reaching One Million Acts of Green—50% faster than expected. Almost two in every thousand Canadians were actively registered on the Million Acts site. Acts resulted in 105,695,538 kgs of greenhouse gas emissions saved in Canada. Central to Million Acts was the idea of bringing people together on the network – driving collaboration OVER the network – a key fundamental of Cisco’s core competence and business. It made me think of the power of Cisco, and how we could further leverage our resources, our people, our technology and our ecosystem drive transformational change – to introduce new models and systems change. It was a lightbulb moment – I knew I wanted to do more of this work. Even bigger and bolder. And I started to develop a CSR strategy for Canada focused on just that – taking what Cisco did best, digital innovation, building ecosystems based on shared values, and aligning for community transformation. Thus was born Connected North, the Women’s Entrepreneur Circle, Not for Profit Connect, and many other Canadian CSR programs that address real social issues with digital solutions. I built the CSR country program function in Canada. We do have a fabulous global IT skills development program called the Networking Academy– our marquis CSR program which is lead out of San Jose. But we didn’t have any dedicated programming tailor made to address some of Canada’s most pressing social issues. 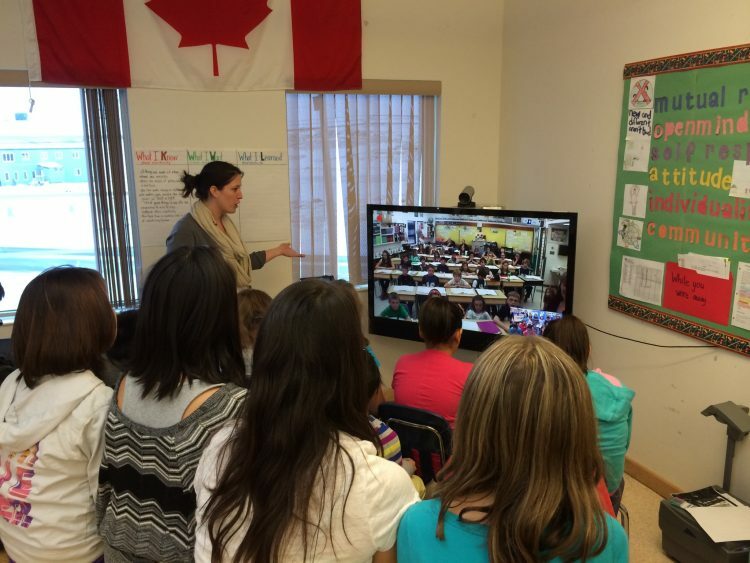 I knew Cisco Canada could play a key role – particularly in the areas of 21st century learning, and telehealth. And so I pitched the idea of a dedicated CSR team based on a plan to leverage our technology, our people, and our ecosystems for social change. I felt passionately about our ability to take action on issues that mattered to Canadians – and to lead on developing and deploying high impact solutions. 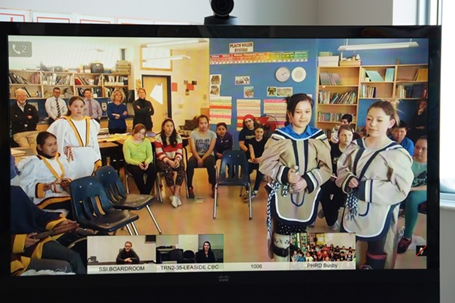 So whether it was environmental sustainability, or building resilience in Indigenous students through virtual programming – I knew we could bring the very best of Cisco to the forefront and execute. And this is what we try and do every day. To get there, I had to win the trust and support of the Canadian team – which meant demonstrating how our CSR could drive meaningful change at the community level, inform our brand, showcase our technology, engage our people and support our business. This took creativity, perseverance and, most importantly, an ability to move fast and get things done! We are an execution machine at Cisco and our CSR approach is no different. One of the great things about working at Cisco is that we have a culture of collaboration – of coming together in virtual teams to make things happen. We don’t stand on ceremony. We collaborate. We take action. Growing up, as I have in the Cisco culture over 18 years, prepared me well for a career in social impact. Understanding the importance of partnership, of looking at technology to address complex issues, to drive scale, collaboration. It’s fair to say I built my skills and knowledge internally. And then combined them with energy and enthusiasm! And a genuine love of being part of this highly effective team! Tell us about Connected North- how did you come up with the idea and why did it make sense for Cisco? Again, it really started with a two year journey of looking at ways Cisco could bring its expertise and core competence to address a major social issue. As part of our research, we met Mary Simon who, at the time, was leader of ITK – the national association of Inuit peoples. Mary talked about two key challenges in Nunavut – the high drop-out rates for high school students, and the tragically high youth suicide rates – the highest per capita globally. 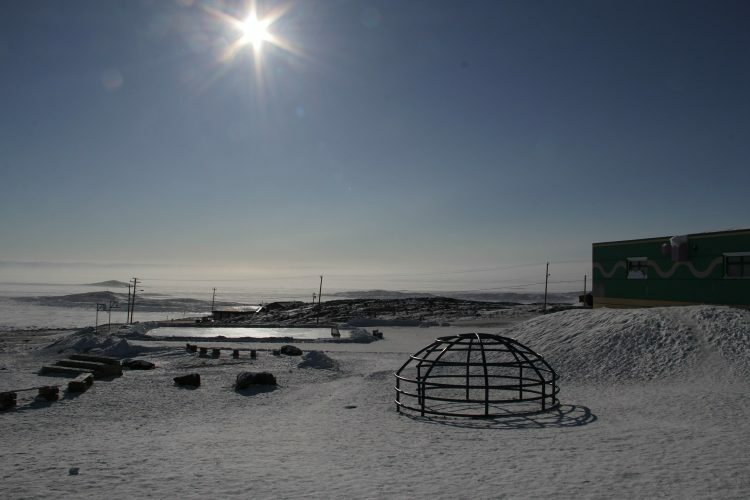 Given the challenges of delivering Mental Health and Education support and services in remote, hard to reach, low bandwidth environments across the Arctic, we set about figuring out a way to get a high definition Telepresence network up and running so these services could be delivered virtually. And then began working with an ecosystem of partners to build the content – training, support and services – that could be customized for each school, and delivered “on-demand”. With Mary’s sponsorship and community introductions we worked hard to build trusted relationships, and launched in our first pilot school in Iqaluit. We started by connecting the students to labs to do science experiments. 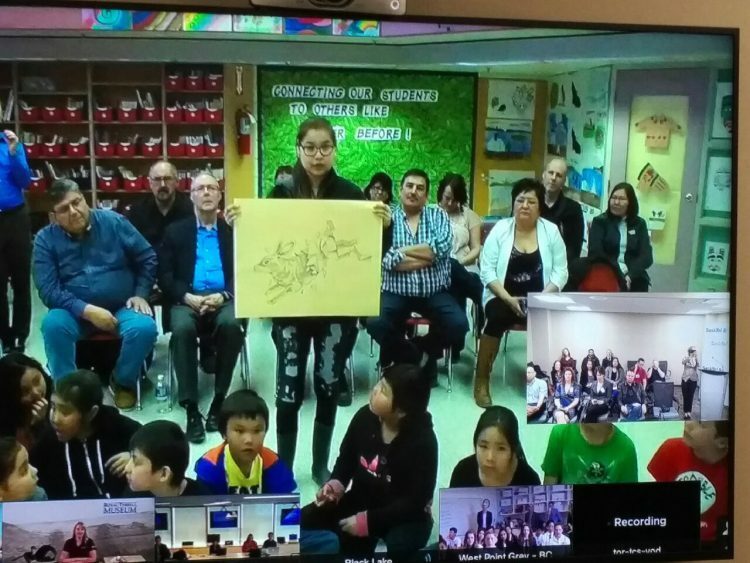 Within two weeks the teachers and students were asking for more – more connections to other schools and students across Nunavut, to peers in the south, to teacher training and support, virtual field trips, youth mental health and wellness services. We knew we were on to something powerful, introducing new 21st C experiential learning models. We worked thoughtfully and respectfully in partnership with the community and schools to deliver what was asked for. 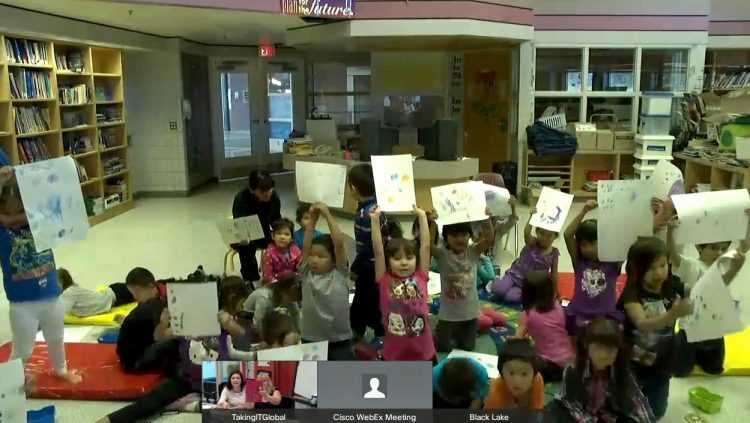 We expanded to two more schools in Nunavut, then the NWT, and Saskatchewan. Word got out and the demand was more than we could manage at Cisco. And so we had to make a choice – to either keep the program relatively modest and support just a few schools – OR to think big, and work towards a vision that could one day see EVERY Indigenous school across Canada connected to the Connected North network. We went for it. Which meant migrating Connected North OUT of Cisco to a dedicated charity so it was set to scale. It was hard to let it go! But we had incubated a solution that had real impact and relevance. We had to move it out so it COULD grow. And we did that in 2016. Today, working with our charity partner TakingITGlobal, and our ecosystem of over 50 members – service providers, governments, private sector leaders, foundations, associations – we are so proud to say that this Fall Connected North will operate in 30 schools. And we are on track to be in 100 in the next 3-5 years. We built the proof-of-concept and quarter-backed an ecosystem of partners who all shared a mandate around Indigenous community capacity building, and building resilience in students. Our results are powerful. And we are proud of the strong positive relationships we have built with communities and Indigenous leadership across Canada. 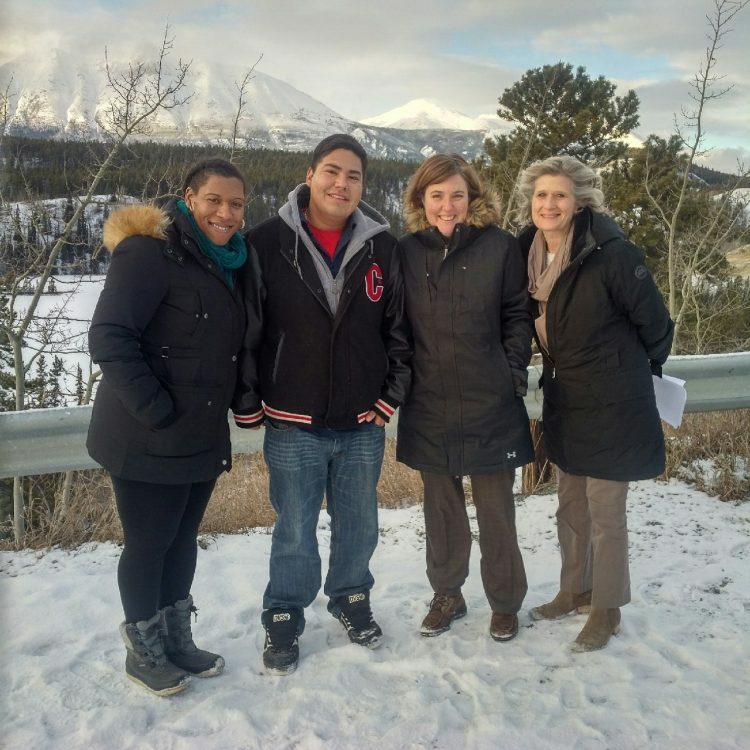 We are set to scale with a network that connects Indigenous students, to each other and to resources that are otherwise difficult to access in the remote north. Last year we reached thousands of students through over 250 Connected North sessions. And growing. Cisco remains heavily engaged as the network partner, and ecosystem leader. What is the greatest challenge you had to overcome to make this idea a reality and how did you go about making it happen? We knew that bringing an internet-based high definition network to remote northern communities wasn’t something we could do on our own. We knew we had to build powerful partnerships and 3P models, engaging governments, the private sector, NGOs, foundations. We needed to establish an ecosystem built on shared goals and values. This was a big hill to climb. It took time and care to identify and engage those partners. We had to keep our Connected North brand recognition high. We had to communicate our success and milestones to prove our case and demonstrate impact. We needed to show results, and ensure a thoughtful, respectful approach rooted in a deep understanding of Indigenous cultures, traditions and ways of learning. We had to persevere and get those partnership solid. When I think about how far our program has come in just four short years it is extraordinary. I am more convinced than ever of the power of collaborative models for social innovation. With so many of us at the table, I think our success came from knowing what we didn’t know. Asking the right questions – most of the time! Never making assumptions. And always, always putting at the core of our work the belief – which binds our ecosystem – that our knowledge of the values, culture and traditions of our Indigenous people informs us all as Canadians. We have all come together to drive powerful, lasting change. A new model. A systems change. A new way of doing things. A network of hope. 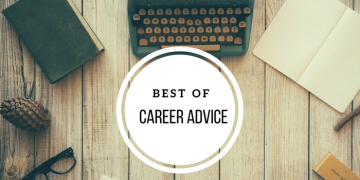 What advice do you have for people interested in having a job like yours one day? Refine your thinking and your approach through careful execution. Don’t move untill you know exactly where you want to go and what you want to achieve. Look at your projects and your program goals in incremental steps. 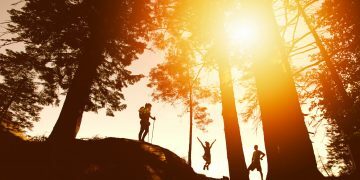 Build partnerships and inspire your partners, or team members, by keeping them connected to your shared goal with excitement and enthusiasm. What are you reading/following that has expanded your understanding of the social impact sector? I just finished the most powerful book – Invisible North – written by a thoughtful, compassionate and courageous young woman named Alexandra Shimo. She spent four months living in an Indigenous community and this is her story of that experience – the challenges and harsh realities of living in a community grappling with deeply serious social issues. For someone like me working in this space, I feel it my obligation to listen and learn as much as I can about the issues I am trying to address. This book stopped me cold. So much so that I tracked the author down and actually met her in person. She was so generous with her time. Her experience, and the experiences of the many, many elders, community leaders, children – so many working and living in the north that I have had the privilege of meeting – informs our work at Connected North. It make us better. We will always be learning.